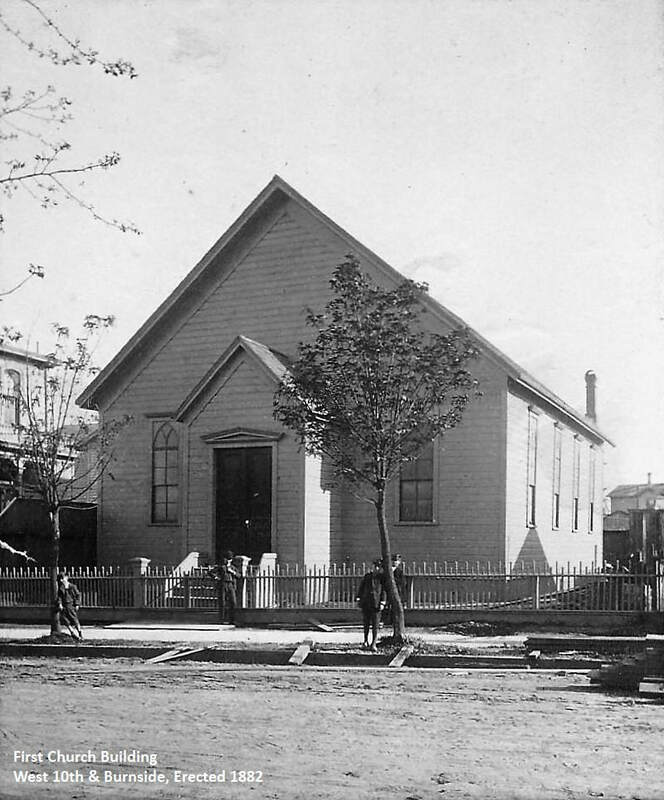 0​First Immanuel Lutheran Church has the distinction of being the oldest Swedish Lutheran Church on the West Coast. It was founded by 23 charter members on December 28, 1879, under the leadership of Pastor Peter Carlson, whose mission work was sponsored by the Augustana Synod of North America. 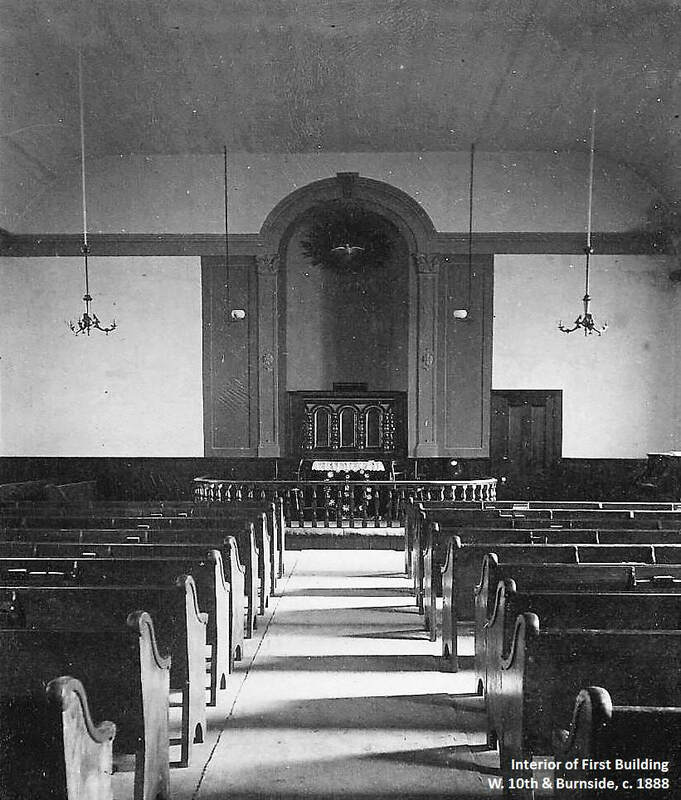 Pastor Carlson officiated at the first worship service on September 14, 1879, at the Trinity Chapel on 5th Street between Oak and Pine. Services were conducted in Swedish in the early years. The church was initially called the Scandinavian Evangelical Lutheran Church, and its name was changed to Swedish Evangelical Lutheran Immanuel Congregation in 1880. In 1881, property on the south side of Burnside between 10th and 11th was acquired for $1,500. In 1882, the church structure on this site was completed. In 1900 the church bell (602 pounds) was rung for the first time on Easter Sunday. It was later moved to the current tower at NW 19th and Irving Street. In 1905 the decision was made to sell the property at 10th and Burnside, and construction on a new building was begun at the present location at NW 19th and Irving Street. The current building was dedicated in 1906. In 1909 the church founded Emanuel Hospital with the leadership of Pastor Carl J. Renhard. The Oregon Synod Lutheran offices remain at the hospital site to this day. In 1913 an organ fund was established and in 1918 the first pipe organ was installed with additional support from the Andrew Carnegie Corporation in New York. In 1975 the current pipe organ was installed in the sanctuary. First Immanuel has celebrated numerous anniversaries since its founding in 1879. While services in Swedish are a thing of the past (though there is a Christmas morning Swedish service even today), and the number of members of Swedish heritage has grown smaller, evidence of the Swedish history can be found throughout the church. The beautiful stained-glass windows in the sanctuary are inscribed in Swedish, and other Swedish customs are honored during the year. While First Immanuel honors its past, it also looks forward to the future with an open invitation to all who are looking for a community of faith today. With the Holy Spirit’s guiding, we continue to innovate and refresh our ministry in order to share the good news of Jesus Christ in ever-changing times.